The Calgary Flames play the Anaheim Ducks tonight. It’s a road game that will see the Flames return to the scene of several of their most painful losses: the Honda Center. The Flames have not won in Anaheim since Jan. 19, 2004, a stretch of futility that has set a National Hockey League record with 25 regular season losses in a row. As the Flames attempt to exorcise their demons tonight, let’s take a look back at some painful, painful losses. If you want to define The Streak by the letter of the law, it’s 25 regular season losses dating back to April 2004. If you’re a stickler and claim that playoff games should count, too, then it’s 29 games dating back to April 2006. The Flames have used 123 different skaters and 16 different goalies during the streak. Jarome Iginla scored in the second period but Martin Skoula and Sergei Fedorov scored within 1:54 of each other to capture the win. The Flames never had a lead in this one. Anaheim scored three PP goals, including one with 5 seconds left in the third period. Another one where the Flames never had a lead. Daymond Langkow scored on a late PP to bring them within one, but Anaheim answered back four seconds later to ice it. Mathieu Schneider scored 35 seconds in and the Ducks cruised to a win. Anaheim got out to a 3-0 lead and the Flames clawed back, but they just couldn’t tie the game. The Flames blew 1-0 and 2-1 leads, losing off a Scott Niedermayer goal 55 seconds into overtime. Olli Jokinen opened the scoring, and the Anaheim scored four goals in the remainder of the first to take over the game. Calgary rallied back but couldn’t quite tie it up. Anaheim got out to a 2-0 lead, but third period goals by Olli Jokinen and David Moss forced overtime. Despite assists on both Flames goals, Iginla was not one of the shooters. Anaheim had a 3-0 lead by 5:49 into the first, but the Flames rallied back to lead 4-3 late. Teemu Selanne tied it up with 2:01 left, and Corey Perry got the OT winner. Anaheim had a 2-0 first period lead, but the Flames rallied back to tie it up. The shootout went to 8 rounds and Iginla was used, so this was just a toss-up game. In a game full of lead changes, Ryan Getzlaf scored with 46 seconds left to break a third period tie. Daniel Winnik scored 1:15 in and Anaheim cruised to a win. Dustin Penner scored 3:26 in and Anaheim led the rest of the way, despite occasional flurries from Calgary. The Flames never led as Anaheim scored the first three goals and cruised to a win. The Ducks got out to a 3-0 led but the Flames almost tied it with a pair of third period goals. The Ducks scored the first four goals and cruised to a win. Ryan Getzlaf had five assists as the Flames blew 2-0 and 3-2 leads. The Flames never led in a game where Anaheim had goals in all three periods. Anaheim scored five goals before the Flames even got one. Clayton Stoner and Alex Chiasson exchanged first period goals, then the Ducks took over. The Flames led after the first period via a Mikael Backlund goal, but the Ducks tied it 48 seconds into the second and took over from there. The Flames have lost in Anaheim for a lot of reasons over the years. They’ve had bad starts. They’ve blown leads. They’ve made asinine coaching decisions. They’ve had comebacks fall short. They’ve been straight up outplayed in roughly 10 of these losses. Can they end a record-setting stretch of futility tonight? Can they finally be a group that actually enjoys going to Disneyland? It’s not a brief history…. last time the Flames won …. Crosby wasn’t drafted and Jagr was in his prime. There are key players injured for the ducks though…. if it’s gonna be soon, it has to be tonight. Jagr is still in his prime, baby!!! But seriously if we don’t win tonight it’s a jersey BONfire, yo. For VICTORY!!! The confidence is strong with this one! Tonight will b duck soup…..if the flames play like the last 2 periods Saturday. Can we play a solid 60 mins? I hope….off topic but Chad Johnson got pulled after 2 periods and 6 goals against….he did not look good at all. “Tonight’s the night, everything will be alright”. It’s Thanksgiving here in Canada; what a great night to put an end to this streak. I sure hope so, talking about this got old a long time ago. I can see the light end of the tunnel. Go Flames Go. That light is the Train and Here it comes .Here comes the Train!!! The you can’t win here chant really p*sses me off, I want us to win just to shut up the Ducks fans. I would love the Ducks to start a losing streak in Calgary just so we can dished it back to their fans for I dunno let’s say 13 years sounds about good to me. Or better: we could pretend we don’t notice it, because the Ducks are just that irrelevant to us. But they aren’t irrelevant!! They’ve knocked us out of the playoffs a bunch of times and we haven’t won in their barn since before Facebook!! I hate them way more than the Oilers. Grrr. This is a streak that defies probability. Most certainly it will end. Is tonight the night? Good luck fellow Alberta hockey fans. Who would trash this comment? Good gravy, let’s have some kindness in the world. It takes a game against Anaheim for Flames and Oiler fans to be in harmony. We need Kesler in the line up to really amp up the dislike. We’ll win 6-2 this evening, and the curse will be over. I see Ferland scoring. Monahan… Gaudreau… Even Lazar. Here’s hoping my crystal ball is not playing tricks on me! What dark and terrible gods do I have to sacrifice to for a Flight win tonight? Probably something worshipped by Bettmen. Not to worry Flames fans. I have the recipe for the Duck curse. 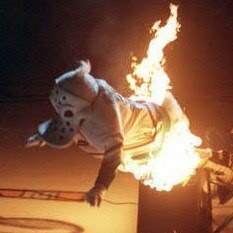 I will be burning a Ducks jersey 5 minutes prior to puck drop. You can thank me 3 hours later! Need some help? Some napalm? maybe some thermite? I’m a previous trained firefighter. 🔥I found an old Duck jersey at a Sally Ann. Been waiting for over 90 days to do this!!! My wheelbarrow is fuc** but it did the job. Charred Duck jersey! Beat them 8-3 in December dumb dumb…..
Kesler is my least favourite player on the Quacks, and he’s not playing tonight. I’m quite excited to not see him hacking and slashing at Monahan all night. I am also very happy that Getzlaf won’t be slaying us all night. If we can get out to an early lead, hopefully this thing will be in the bag. Gaudreau – Bennett – Lazar was quite interesting to watch on Saturday, they generated chances every time they were on the ice together. Let’s see if they can bring it again. Time to defeather the Ducks and make them go down. Get that streak over and done with tonight. October 9, 2017: the losing streak ends.